1. Tells us about growing up as a Boitano? I loved growing up as a Boitano. I should probably write a book. My older brother, Mike, and I enjoyed playing sports in school and at a very early age got involved in road and x-c running with our parents. 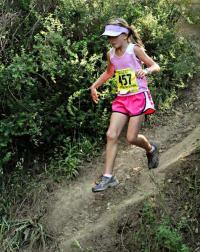 One of her favorite races is the Dipsea in Marin County just north of San Francisco. 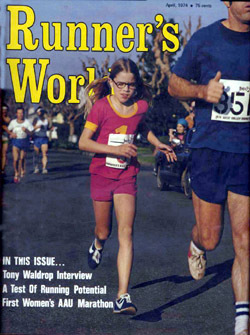 She won the Dipsea in 1974 at age 10. 2. Your parents was very involved in the running movement? 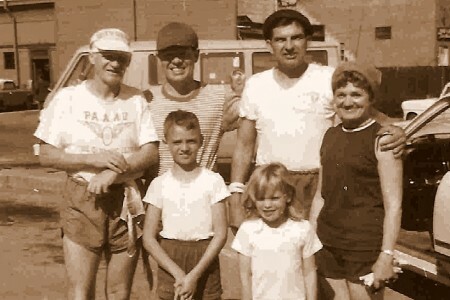 Both of my parents, John and Lucille, were instrumental in starting two running groups. 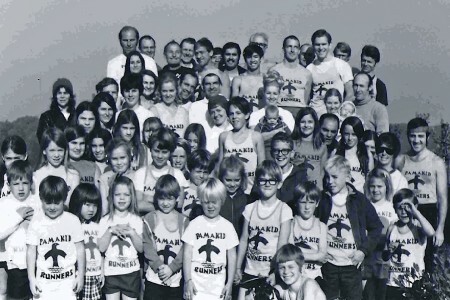 In 1967, our family started to run around Lake Merced every Wednesday and then go to Shakey's for pizza. People would pull their cars over and ask what we were doing. We told them we were running to stay in shape and invited them. At the time, we unknowingly were recruiting runners. The word spread about us and a running group started to form. It got so popular, that we started to have races. It was fun and the runners were mostly parents looking forward to having pizza and beer after our runs. The kids looked forward to pizza, playing arcade games, watching the black and white videos like the Little Rascals and Laurel and Hardy and playing outside with each other. That is how the PA-MA-KIDs Club started. My father was also a member of the South End Rowing Club (SERC) and Walter Stack was a member of the Dolphin Club. Walter lived up the street from us and on Saturdays we would run 20 miles with him. Then on Sundays, we would head down to the club and race along the Marina and the Embarcadero. Word spread that our family was running at the SERC too so we had tons of runners showing up there each week on Sundays. The numbers grew. 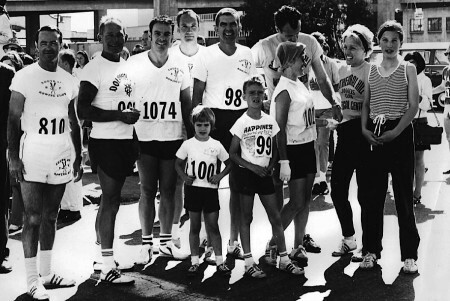 My father and Walt combined the two clubs and started the DSE Runners. These are the two biggest running clubs in the city today. Photo: Early days of the DSE Club. Walter Stack, my family and Pax Beale at the 1969 Bay To Breakers. My mother and I were instrumental in getting the approval in 1971, from the AAU to run in road races. Before then, women were not allow to run races longer than 1500m. That was also the limit in the Olympics. My mom and I would enter races before 1971, with our first initial and our last names. We wore caps and scarves to hide our hair and dressed in a t-shirt and shorts. Most people thought I was a little boy and no official would dare mess with my mom or me by pulling us off the race course for fear of the wrath of my father. My father was WWII Airborne. He made it through three big campaigns which were Normandy, Market Garden, and the Battle of the Bulge. He jumped into Normandy and into Holland and fought in Bastogne during the Battle of the Bulge. My parents were very well liked so I guess most of the officials turned a blind eye to my mom and me. 3. Was it your idea at age five to run a marathon? No, it was my parents' idea. I was curious about the race though and wondered if I could finish it. Unfortunately, I didn't. I ran 20 miles and quit. DNF was the acronym you got in the area of where your time should have been posted in the race results. I hated to see that and it was on the big board at the finish and came out in the race results. At the time, I was very disappointed. I wanted to finish. 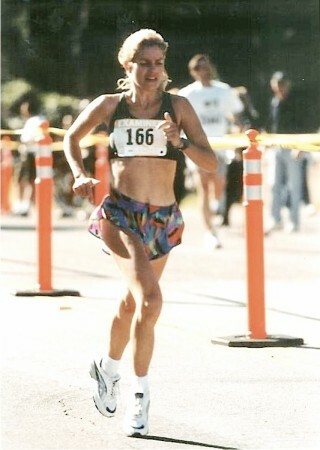 My first marathon was in Petaluma and it was 25 degrees and raining that morning. I wore a t-shirt and shorts and was freezing. I spent over 3 hours running in the cold and rain. I was miserable and could not wait to be done and back in the car heading home. In retrospect, I think I did pretty well. 4. Do you remember what it was like pushing yourself at that age? I had endless energy. I loved running in Golden Gate Park. I chased my brother all the time. I was hoping to some day be as strong as he was and beat him. However, that only happened a couple of times. 5. What kind of training were you doing? We did it all. We did hills of course living in the Castro in San Francisco. We were surrounded by hills. We trained on trails. We traveled to Marin and ran a lot on the Dipsea and did fartleks. We did mile repeats on the roads. We did intervals on the track. I loved running stairs and we would train up 22nd Street. It prepared us for the 647 steps at the beginning of the Dipsea. PHOTO: Start of the Dipsea near the Train Depot 1967 with my family. 6. Were you also able to do "normal" kid things? I was pretty much able to do everything I wanted to do. My parents were pretty guarded, however, as far as my legs were concerned. My father did not want me to go skiing or ice skating for fear of falling and hurting myself. I can understand that considering I had some big races that I needed to run. 7. At age 10, you ran a 3:01 marathon. An amazing time for any age? I remember that race well. It was in Burlingame. It was the first national women's marathon. There was a discussion about men running in it and eventually men were allowed to compete in the race as well. I ran a pretty conservative race. I remember feeling like I was running too slow. My father wanted me to run around 3 hours so I had to be smart and run a little faster than a 7 minute pace. The course was easy to gauge because we ran a five mile loop five times and then a one mile loop. Even though it sounds pretty boring it made it easier to race and pace yourself. 8. Why do you think you were able to do what you did before your 13th birthday? I did what I did because I had the family support. That is what we did. We trained. We started running back and forth to school. It was nothing but hills on the way home. When my father came home, we would head out and run some more hills. Sometimes we would drive places to run. Other times we would just run from the house. Our whole life was running and keeping fit. 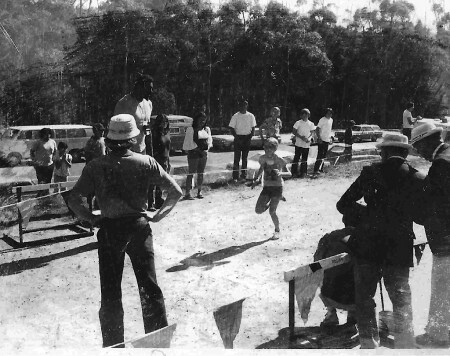 PHOTO: winning the Jr. Olympics 1974 State cross-country title. Wilt Chamberlin at the finish to hand me my finish popsicle stick. 9. You were getting a lot of attention? How was that like? I loved the attention. My brother did not. I could not understand why he did not. I understand now. He is pretty humble. I cannot seem to keep quiet though myself. I want to inspire as many people as I can to put on their running shoes and go. Publicity is a great way to accomplish that. 10. Do you still enjoy running? Do you run any races? I have not really stopped. I have been running now for 45 years. I run a couple of races a year sometimes I pay the fee and run and sometimes I do not. It depends on my mood if I want to race and place. So, I have been known to bandit races from time to time. I love the Bay to Breakers and the Dipsea. I just like the energy and the spirit of the races and I like to be around it. I have some friends who I train with on the weekends and we show up at certain races and run for the fun of it. 11. You and your brother Mike set many age-group world records in the 1970's. Others in the 70's like Julie Mullin beat your times. But there have not been any kid marathon stars in recent years. Why do you think this is? My brother and I probably shared 10 world age-group marathon world records maybe more. We had loads of people claiming to be medical experts telling my parents that running distances was harmful for us. We had tons of publicity. Maybe some of those parents who had running kids listened and believed those experts. 12. As a mother, do you think other kids under the age of 10 should be running marathons? Running marathons are not for everyone especially not for kids. People who train for a marathon usually only complete one, but not two. I planted the seed early with my own boys to run. We ran trails mostly and hills up to about eight miles. As a high school x-country and track coach, I encourage kids to run cross-country and track in school and races up to about 10K. You lose the speed as you age. You have to use the speed when you are young and save the marathons for the older runners who have really lost that angle. I seem to have done that backwards. It was okay with me. I have no regrets. If I were to do it all over again, I would have liked to have trained for the 1500m and had taken a shot for the Olympic trials at that distance. 13. Were you running for yourself? Or for your parents? I ran for me. I was a natural trail runner. I loved running cross-country. I idolized Pre. I wanted to be just like Pre and hold as many records as he did. He was inspirational and made running look cool. I would have liked to have met him. 14. Do you have positive memories about this time in your life? Yes, it was a great time. My family and I had a real bond. My father is 90 and my mother is 88. They are still living independently and my mom walks the dog every morning. My dad is somewhat fragile with some minor health issues, but gets around pretty well with the walker. My brother and I continue to run together a couple times a year which brings back awesome memories. We had so much fun. We played ball on our runs, chatted the whole way, and occasionally we would find a shopping cart and give each other a ride in it for miles. We met loads of people and established friendships that we still have today. 15. I have young grandkids that love running but it seems like there are a lot of people around these days that think that young kids should not be pushed to "run their guts out." If the kids want to run and run hard, encourage it. Unless there is something wrong physically with their feet, heart, or bodies, then let them run. It is beneficial to the body and soul. It makes you feel good. You have a thirst after you run and an appetite. Water tastes better. You sleep better. Running makes a positive lifestyle. The hardest part of doing it, is putting your shoes on in the morning. 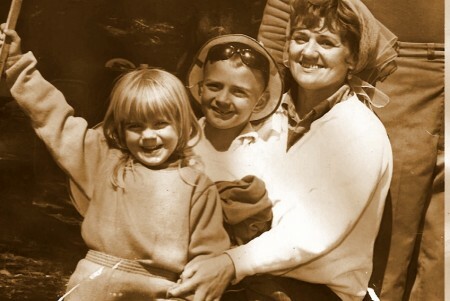 PHOTO: With my brother Mike and mom at Dipsea 1968. 16. Do you ever follow the kid running scene? No, but I follow the high school scene. One of my goals is to produce great high school athletes. I am new to coaching and I am trying to build my athletes right now. I would love for them to be successful and have colleges come to me and offer scholarships to them. 17. What is the most miles you have ever run in a week? I went over 100 miles in a week my first year of coaching and I did it for several weeks. It was ideal for me and I will never do that again. I did it on and off for a whole track season. I would run a double workout. I would do my workout in the morning of 10 miles and then I would go to track and run their workout. Never again. I like to run about 60 - 70 mpw. When I coach now, I take the bike if we go off the track. When the kids run on the track, I time them. This is the opportunity for me to rest my legs. 18. Did you run in college? I ran for SFCC (Jr. College) and SFSU. I was a mediocre college runner. I cannot say that I was much of a standout. My focus was on college and not running especially the social part of college. I had so much fun as a student. 19. What happened after college? I graduated and became a nurse after college. I started working part time as a orthopedic nurse and worked at Marshall Hale in San Franisco. I continued to run recreationally and jump into DSE, Pamakids, and AAU races. I have a wonderful family of my own. Richard is my husband and two boys John and Richard III. 20. Do you follow the current running scene? You bet. I love running. I cannot get it out of my blood. I read books and magazines about running, check out races online, watch races on tv, and talk to other coaches and athletes. 21. How important is running to you now? It is very important. I am working on keeping up my speed and staying in shape. I hope to keep running until I die. Running can be a very social sport too. When you run, you meet people and you can develop strong relationships with people who have the same interests as yourself. I also coach so I am responsible for the next generation of athletes. 22. Does your family run? Yes, my husband Richard runs about 4-5 days a week. He loves trails like I do. He does not like to run with me however since I talk too much and he wants to concentrate on the pace and the scenery. My oldest, John, goes to the University of Oregon. He recently purchased a new pair of Nikes and is running. He probably has the most talent beside my brother in my family. 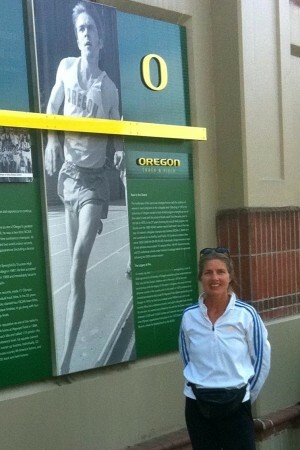 I wish he would step out on the track at University of Oregon and have the cross-country/track coach watch him run. He has perfect form like a thoroughbred. However racing is not his thing, even though he has amazing speed. My youngest, Richard III is a high school football player at Justin-Siena High School in Napa. He runs to stay conditioned. I can not ask for anymore than that out of a football player. 23. What are your plans for the future? I want to be a great master runner and coach. I am thinking about qualifying to run seeded or sub seed in the Bay to Breakers either this year or next year. I love that course. The race and the officials have always been so wonderful to me. I have to qualify by running a USATF course. I am hoping to find a 5K before the race and then submit my entry fee. I am all about preservation after running more than 120,000 miles. I tell the kids that I work with, that they are in the training mode and I am in the preservation mode so don't let me pass you.